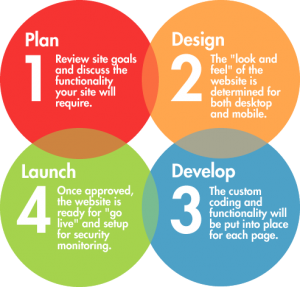 When it comes to building your website, Designs 4 The Web walks you through the process to ensure that each aspect of the development goes smoothly. Designs 4 The Web is a Connecticut based Website Design company that offers a variety of services including website design and development, responsive/mobile website development, WordPress theme customization and training, and much more. We primarily work with businesses located in Fairfield County and New Haven County but due to the nature of the business can work on projects virtually anywhere in the world. How Important is a Professional Website Design? We have all found ourselves on a “bad” website. We didn’t intend for it to happen. It just…happened. The information you were looking for was either missing or difficult to find. The site loaded slowly. It was unprofessional looking, perhaps full of advertisements. Eventually, sooner than later, you leave the site frustrated and move on to another website. A competitor’s website. There you find what you are looking for and continue on with your day. The “bad” website has lost potential business…again. Is a professional website design important? Absolutely. It is the single biggest factor contributing to a visitor staying on your site and becoming a customer or leaving and contributing to your bounce rate. In the mind of a consumer, the quality of your product or service won’t matter if you lack a professional looking website that is easy to navigate and keeps their attention. There are many factors that contribute to a professional website design. For example, a professional website employs a clean layout and is easy to navigate. Functionality is extremely important on website’s today. If a visitor can’t find what they are looking for because of a poor navigation system or worse yet, the content doesn’t exist, they will leave your site and continue on to a competitor. A professional website also includes well written, informative content written in an engaging matter. Alongside the content should be pictures, video, infographics and any other type of media that enhances the overall quality of the page. In addition, there are many technical aspects that contribute to a professional website including semantically written code, discreet page loading, and a responsive structure that adapts to each individual device. Looking for an example? Look no further than this site! My website is a demonstration of a clean, professional layout, well-written engaging content and a responsive/mobile design. If you’ve never seen a mobile website design, check out the video to see how the layout changes depending on the device’s screen size. In addition, be sure to check out our portfolio page to see examples of our most recent work. How Do I Hire a Professional Connecticut Web Design Company? Hiring a professional Connecticut web design company can be difficult because there are so many options available across the state. By far the most important aspect of hiring a Connecticut web design company is to do your homework and shop around. If you are getting an estimate that seems to good to be true, chances are you will be disappointed with the outcome. Equally as important is asking questions to learn more about their skills and methods. Any professional website designer will welcome your questions and discuss the process with you before looking to cash a check. When narrowing down your selection of a Connecticut web design company be sure to see a portfolio of their work as well as testimonials from their previous projects. If a designer doesn’t have work samples or references, you should keep looking for another designer. It’s also a good idea to ask them about their background and skill-set including how they stay current with emerging practices and technologies. As with any computer related field, things change quickly and a professional designer stays on top of those changes. Last, but certainly not least, inquire about rates to see if they charge an hourly fee or based on the project. Inexperienced developers who charge an hourly rate will be learning at your expense while project based designers may overcharge for their experience. If you’re not sure about something, don’t be afraid to ask about how the rate is calculated.